Neath Port Talbot Council elects a new mayor for each civic year. The Mayor’s role is to be an ambassador for the area, supporting local community, voluntary and charity groups throughout the year. The Mayor for 2018/19 is Councillor Dennis Keogh and the Mayoress is Mrs. Christine Keogh. The Mayor’s theme for his time in office is community and culture. 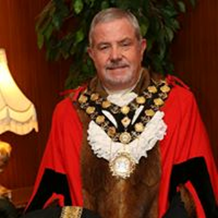 The Mayor wants to raise awareness of all the good work being carried out across the county borough, to promote an appreciation of and encourage the diverse cultures and talent within our local communities. One of the ways in which the Mayor supports the communities of Neath Port Talbot is by nominating a chosen charity or charities during their year in office. For this Civic Year, the Mayor has chosen to support Tŷ Seren and Hafal, two local charities that deliver important and much-needed services to those in need in our local communities. As well as carrying out hundreds of civic duties during the year, chairing meetings of the full Council and attending annual events, the Mayor is involved with a programme of events designed to raise awareness of all the good work being carried out across the county borough and/or raise funds for the Mayor’s Charities.